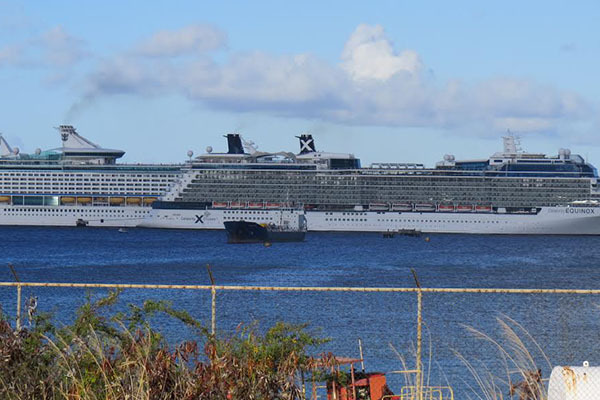 Basseterre, St. Kitts (CUOPM) – Royal Caribbean’s Adventure of the Seas has been forced to cancel two port calls after an oil loss from the ship’s fixipod propulsion unit forced the shutdown of the pod as it arrived at St. Kitts’ Port Zante on Tuesday. The problem forced the ship to depart St. Kitts at 3 a.m. Wednesday instead of 5 p.m. Tuesday. Royal Caribbean confirmed the issue stating that as the Adventure of the Seas was arriving to St. Kitts, the ship became aware of oil loss from the ship’s fixipod. The fixipod cannot be repaired until the ship goes into dry dock March 30, though the line said the ship’s next sailing should not be affected. The work necessitated the delay of the ship’s departure from St. Kitts until 3 a.m. Furthermore, because engineers could not complete a permanent repair, the fixipod will remain offline until the ship goes into dry dock March 30. This will cause the ship to sail at a reduced rate of speed. The combination of the delayed departure from St. Kitts and the reduced speed has forced the ship to cancel its scheduled port calls to Aruba (March 20) and Curacao (March 21). Instead, Adventure of the Seas will visit Antigua Wednesday, St. Maarten on Thursday (staying overnight) and St. Croix on Saturday.